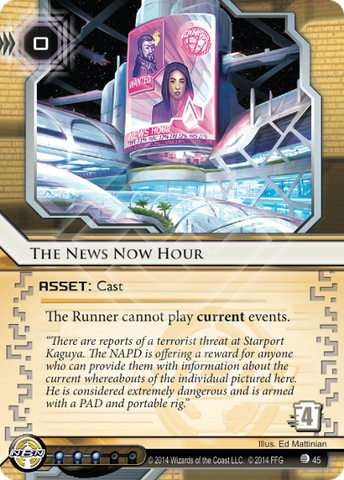 "There are reports of a terrorist threat at Starport Kaguya. The NAPD is offering a reward for anyone who can provide them with information about the current whereabouts of the individual pictured here. He is considered extremely dangerous and is armed with a PAD and a portable rig." This card is starting to look a bit more appealing, for one big reason: Employee Strike. As of this writing, (Midway through the Mumbad cycle) there are several corp decks that depend fairly heavily on their ID ability. Industrial Genomics decks have finally come into their own, and there are at least a few Haarpsichord Studios decks at the edge of viability. This card? Stops that. They simply can't play it without spending an imp token (or 4) first. Which also gives you some lead-time, since it telegraphs their plays a bit - if the runner spends resources to trash this, you can probably assume they have a current they want to play. I'm not sure it's worth the deck-space just yet, (or the hefty 3-influence outside of NBN) but I'm starting to see a world where it might be worth the include. Definitely one to keep in mind, as runner currents improve. As of right now, this is beyond unplayable. There aren't runner currents strong enough to warrant a counter, nor are there corp currents that absolutely NEED to stick around. With that said, NBN is rumored to get some nasty tools in their big box to make them THE current faction, and this card might not look so bad then. It'll be hard to find deckspace for something like this, but a 1x might find its place into a deck if the card pool allows it. 0 rez, 4 trash is an amazing ratio, and the ability is very restricting for the runner. From the perspective of halfway through the Red Sands cycle The News Now Hour is a decent card. While Rumor Mill has been MWLed into oblivion Interdiction and Employee Strike are still very viable options. TNNH especially has synergy with NBN: Controlling the Message. It's a good way to prevent Employee Strike shutting down the CtM tax and at the same time that same CtM trace makes going after TNNH even more expensive. Since TNNH is not unique and costs nothing to rez it's nice in an asset spam setting if you benefit from having lots of servers, such as Diversified Portfolio. Having several TNNH's on the board also makes it even more expensive for the runner to get rid of the effect.